This is my second attempt at Gyotaku. I came across the beautiful Black Crappie that was used to make this print in an unusual way. I was out fishing when I noticed a couple Osprey diving for fish. One dove, hit hard, and stayed in the water for a few moments. This is unusual. Osprey usually pop right out with a fish in their talons. After a moment, the Osprey struggled to rise into the air. It got about a foot off the water with a large fish in its grasp. Unfortunately for the Osprey, the fish was too large, so it dropped it. I noticed that the fish was floating on the top of the river, so I paddled over to take a look. It was this 14 inch Crappie. Since there was no reason for it to go to waste, I scooped it up and took it home. Upon closer observation, I was surprised that there was very little visible damage to the fish. It had a few shallow punctures from the Osprey's talons, but nothing major. I supposed the impact of the strike killed the Crappie. After making this fish print, I cleaned and immediately cooked it. Crappie is a wonderful tasting fish! In retrospect, perhaps the fish was already sick and floating near the surface when the Osprey attacked. Lesson learned: Don't trust a bird to provide your dinner! 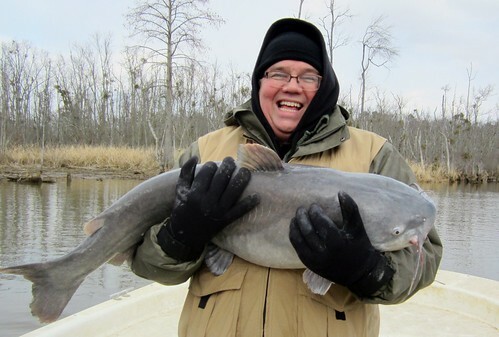 A 62 Pound Catfish Adventure! Every year I try to plan a big fishing trip. 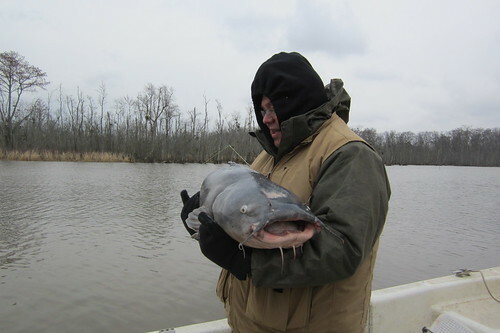 This year I decided to go after a citation blue catfish. 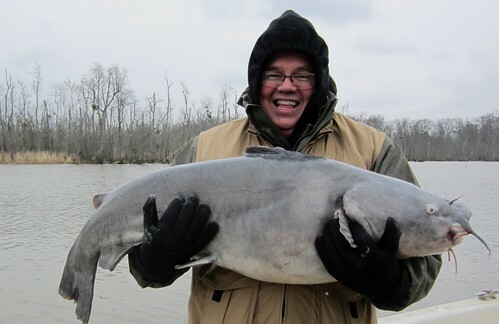 I chose the very best place for blue catfish, the James River, and hired the best catfishing guide, Chris Eberwien. These ended up being good choices! I highly recommend hiring a a guide the first time you fish for a new species or in a new area. Hiring a guide does not guarantee a good fishing trip, but it will teach you how and where to fish. 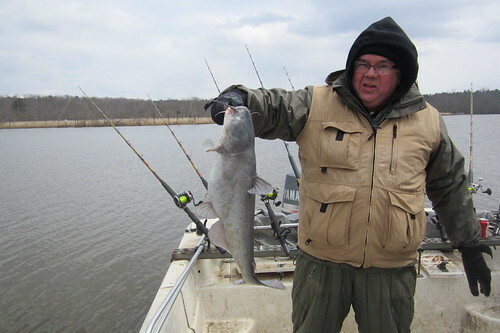 Also, guides usually have the specialized equipment needed to fish an area. In this case, our guide provided a 24' Carolina Skiff and 9 heavy rods and reels. I don't have this equipment and cannot afford to buy it. The weather was COLD. The temperature was in the low 30's with a 17 mph wind. It snowed most of the day. After catching the bait, we zoomed over to a creek to get out of the bitter cold wind. Our guide went to a spot with some structure and we cast out nine chunks of bait in a fan pattern. 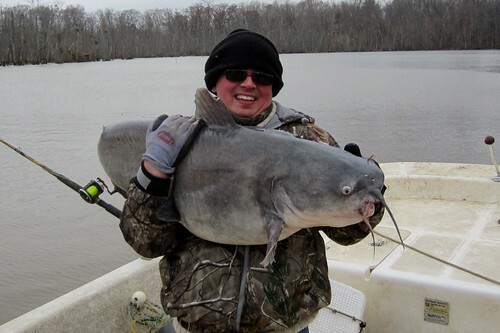 In less than 15 minutes I broke my personal best catfish with a 57 pound monster! Seeing such a large fish come out of a seemingly small creek was surreal. 15 minutes after my big fish, my dad caught the biggest of the day. A 62 pound brute! We hopped from place to place, getting a few nibbles, but nothing substantial. After a couple hours, we moved further up the creek to an area covered with sunken barges. We could see their tips sticking out of the water. It was next to one of these barges that I caught the hardest fighter of the day, a 41 pounder! This fish was one of the hardest fights I have ever encountered. It peeled a ton of drag that was set to 12 pounds. It did not want to come in! We hit a string of "small" cats. On a normal day we would have been excited to catch these fish, but compared to a 62 pound cat, a 12 pounder is a minnow. We finished off the day with dad catching a nice 36 pounder. 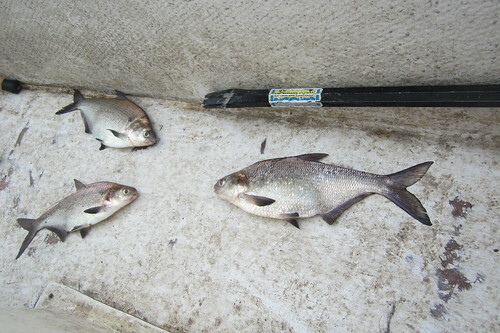 All the large fish were released. 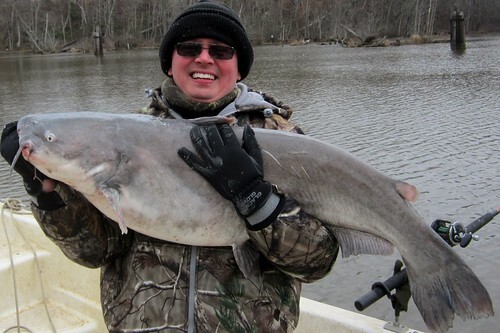 You aren't supposed to eat fish over 10 pounds out of the James River. The pollution is too bad, they turn toxic. I wouldn't have kept them anyway. I don't like killing big fish, they bring me too much joy! Between the two of us we caught over 200 pounds of catfish, two citations each! Not a bad day! I did keep a little 8 pounder for dinner. All that catfishing got me in the mood for fried catfish and hush-puppies! I've been down and out lately. My wife got the stomach flu, then my youngest daughter got it, then I got it, then my oldest daughter got it, then I got it again. It was terrible. The day I started to feel better I took my kayak out of a relaxing couple hours of bass fishing. Didn't catch anything, but found a new lake only accessible by kayak. As I was loading my 'yak onto my truck, I slipped in some mud. I fell and the kayak fell on me. My knee was hurt pretty bad. Then I got an ear infection. I was trying to mimic the coloring of a Croaker I caught last year. I just can't seem to find lures that mimic Croakers, a common bait fish in my area. Keep in mind that this was the first time I airbrushed anything. It took about an hour and a half. I am pleased and already have a couple others in the works. I can't wait to give it a try on the water!